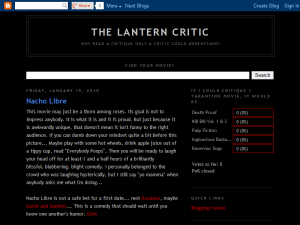 Blog Description: "The Lantern Critic" is designed to be a blog that fairly critiques all movies for you in a way that will help you determine if it is a film you would like to spend your time and money watching. My main goal at "The Lantern Critic" is not to tell you if I enjoyed the movie or not, or not even to tell you if I believed the movie was well made. My Primary concern is to make sure you do not feel you are sacrificing a single ounce of your time or money to go see a movie that has been misrepresented. An adept critique of "Avatar" explains what exactly all the fuss is about. Trying to decide the best movie for your buck? This may help. Can't decide if you are willing to give up 2 hours of your life for this movie to make your girlfriend happy? This may be just the thing for you.